Jackrabbit - Transmits the transaction (ePayment) to the payment gateway and receives approval or decline from the gateway. Jackrabbit is not involved in the approval/decline process. Payment Gateway - Accepts transaction in ‘bunny’ language, translates to ‘bank’ language and forwards to merchant services provider/merchant processor. Merchant Services Provider - Coordinates the processing of the transaction between the customer’s card issuing bank and the merchant’s bank account; does the approval/decline. Jackrabbit - When an ePayment is initiated in Jackrabbit, it is immediately sent to the gateway; there is no ‘batching out’ process like there is for many stand-alone processing terminals. Transactions are stamped with the date the transaction was initiated (as per time/date settings in your Jackrabbit database) and are reported on in Jackrabbit based on that date. Payment Gateway - Transactions are received in the gateway and held until your settlement cut-off time. At that time they are batched and submitted to the merchant processor for settlement. KNOW YOUR SETTLEMENT TIME. This is when the “train is leaving the station” and if you miss it, you will have to catch the next one (which won’t be until tomorrow). If your settlement time is set to 8:00pm (the default setup for most providers), all ePayments processed in your database between 8:01pm – 11:59pm will not be batched out until the following day. What this means is that Jackrabbit's Deposit Slip will show that you received the money on 12/31/15 (for example) but your gateway settlement reports will show that money with a settlement date of 1/1/16. This can create havoc when attempting to reconcile. It is recommended to adjust the settlement time in your virtual terminal/online gateway account access to as late in the day as possible: most gateway providers will not allow a cutoff time later than 11:30pm. See Set a Settlement Schedule for your Gateway. 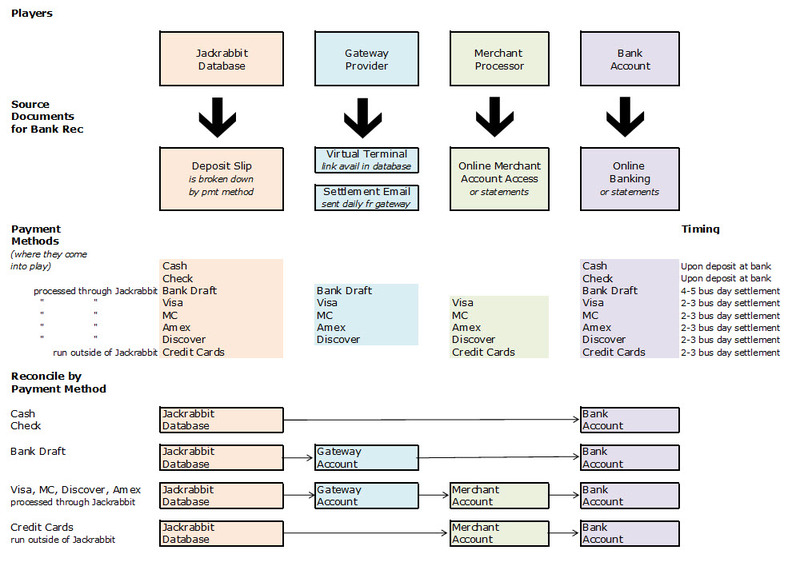 Merchant Services Provider - Transactions are also batched out from the merchant processor. Each processor has their own default settlement times. Contact them to inquire as to what their time is. Deposit Slip Report - Provides a list of payments (credits) received in the designated time frame sorted by payment method. Advanced Transaction Search - With the search criteria Credits Only click on the ePmt column to separate payments submitted to the gateway (ePayments will have a symbol for approved or declined) from non ePayments such as checks, cash, or a credit card payment processed through a stand-alone terminal (not through Jackrabbit). If you also process credit cards outside of Jackrabbit create a Payment Method drop-down, for example Visa-nonJR, and use that when recording those payments. This way those payments will be distinguishable from the ePayments you processed in Jackrabbit which is very helpful when trying to reconcile. Ensure that you are setup with a monthly billing structure for your merchant processing fees. With this method, all fees are taken at the end of the month and the daily deposits to your account will match your Jackrabbit/gateway reports. Always follow up on bank draft/ACH payments in your bank account; some banks will send out returned item notifications but many do not.